netec brine circulation pump and safety units type PGR-2 simplifies the installation, because most of the here needed system components are prefabricated, connected and pressure tested. PGR2 has DC high efficiency pump WILO Yonos Para ST 15/7.1 PWM2 (lower picture). It’s designed to support ventilation units up to 600 cbm/h airflow in combination with controller type HTR2-2. For systems with higher flow rates no ready-pump groups are offered by netec. The necessary sizes of such pumps must be individually designed according to the respective fluid flow and the systems flow resistance. To be compatible with the brine pump regulator netec HTR2-1, only single-phase AC pumps are to be used without electronics, because the continuous control of the controller HTR2-1 runs with 230 V and with a pulse width modulation. To be compatible with pump regulator HTR2-2 it should be a WILO Yonos or WILO Stratos pump for cold water useage, in an “PWM2”-edition compatible to the pump, that is installed in pumpp group PGR-2. Such models are shown here. 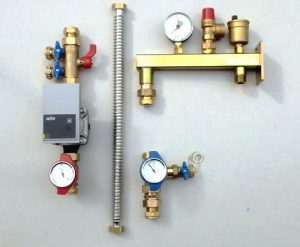 – a safety unit with pressure valve and gauge as well as a link for the hose to the pressure balance tank. Furthermore, the mounting-racks, a 50 cm (some 20 in) hose to link to the pressure balance tank and a mounting angle for the tank is supplied. The tank itself must be customer supplied and its size chosen according to the brine volume of outdoor brine pipe installed. Netec pump and safety units are pressure tested. Varying from the picture, the PGR units is complete with plug-in mains cable or system sockets thus avoiding all electrician’s wiring.